The Single Kernel Characterization System Test evaluates wheat kernel texture characteristics by measuring the weight, electrical current, and force needed to crush the kernels. Kernel characteristics are related to important milling properties, such as conditioning (tempering), roll gap settings, and flour starch damage content. Wheat samples are milled to evaluate wheat milling properties, including flour extraction and the amount of non-flour components produced, such as bran and shorts. Buhler Laboratory Flour Mill results are expressed as the weight of flour, bran, and shorts. 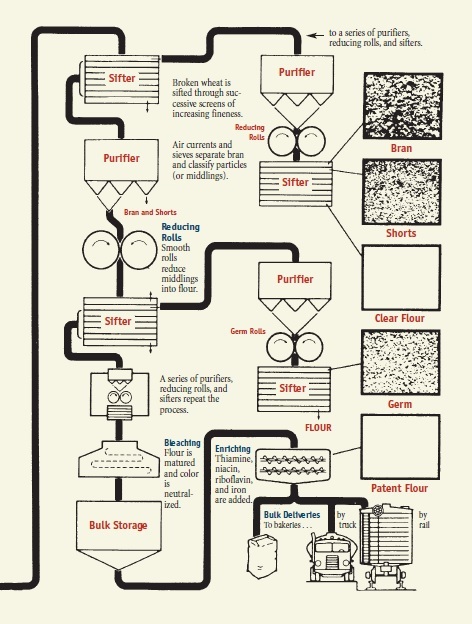 Often, flour extraction is reported as a percentage of flour compared to the total output of other mill products. Flour is produced for other tests. Small samples of wheat are milled on the Buhler Laboratory Mill to produce flour. 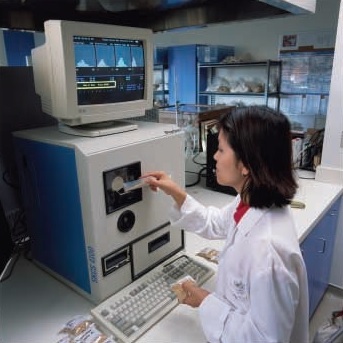 This flour is used to evaluate properties, such as ash and protein content, and in gluten strength tests, such as the farinograph. The Amylograph Test measures flour starch properties and enzyme activity which results from sprout damage (alpha amylase enzyme activity). Sprouting in wheat, as indicated by high enzyme activity, produces sticky dough that can cause problems during processing and results in products with poor color and weak texture. For Asian noodle products, flour of medium to high peak viscosity is preferred because it gives noodles better texture characteristics. Both the amylograph and the rapid visco analyzer measure starch viscosity properties. The amylograph is more commonly used throughout the world. The RVA uses a smaller sample and takes less time than the amylograph. 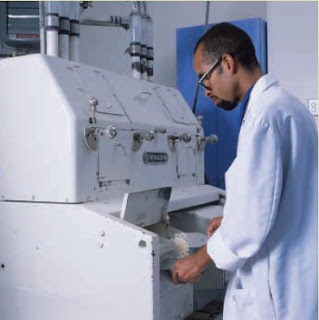 The Amylograph Test measures and records the resistance of a heated slurry (a flour and water paste) to the stirring action of pins. 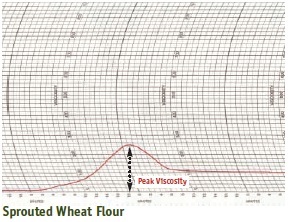 Peak Viscosity is the maximum resistance of a heated flour and water slurry to mixing with pins. It is expressed in Bradbender Units (BU). 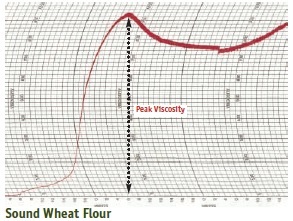 Sprouted wheat flour has a lower peak viscosity than sound flour. 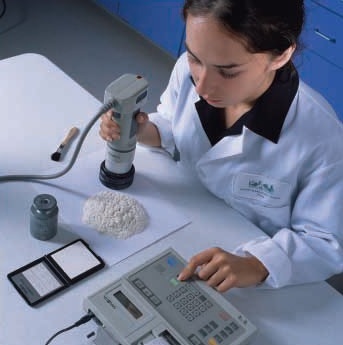 The Rapid Visco Analyzer Test measures flour starch properties. For Asian noodle products, flour of medium to high peak viscosity is preferred because it gives noodles better texture characteristics. The rapid visco analyzer can also be used to determine the stirring number, which is related to sprout damage. A stirring number test is performed to measure enzyme activity that results from sprout damage (alpha amylase enzyme activity). 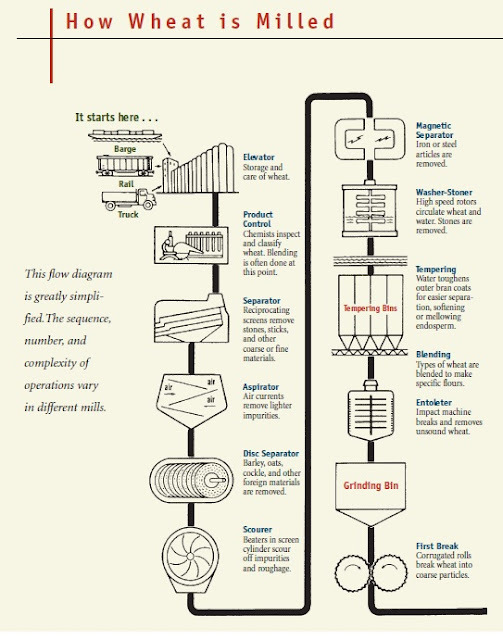 Sprouting in wheat results in flour that produces sticky dough that can cause problems during processing. Sprout-damaged flour also produces products with poor color and weak texture.